The dolphin are biting!! Mahi-mahi dolphin are being caught in 100-200 feet of water, on and just outside the Fort Lauderdale reef. Today and yesterday were both good days for catching these delectable gamefish. We started out catching some fresh ballyhoo by tying up the mooring buoys and chumming them up. When we had the ballyhoo chummed up well enough, we threw the net on them. One net throw is enough for the whole day. We went out to 100ft of water and started slow trolling the ballyhoos out of the outriggers. Live ballyhoo drag well if you go slow and bump the boat in and out of gear. 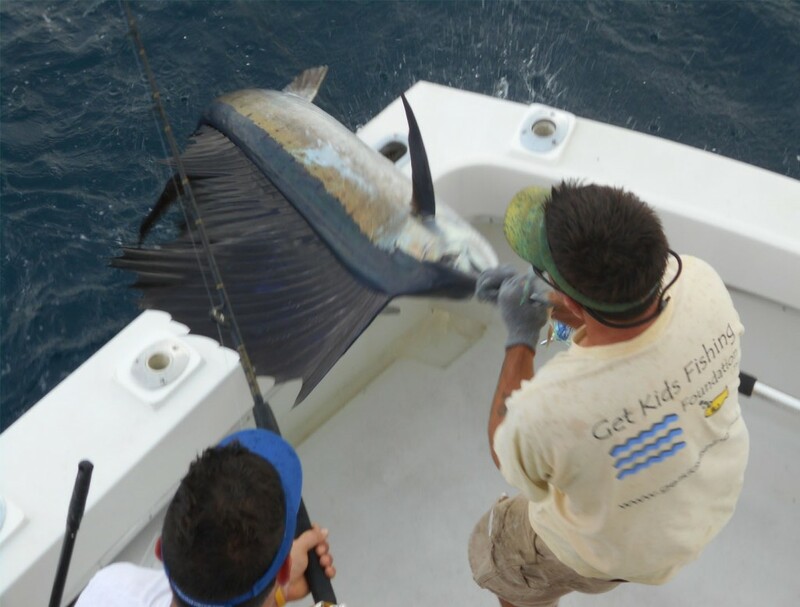 This is a great way to catch sailfish, mahi-mahi and blackfin tuna. It took about 45 minutes before we got our first bite. We got a double header dolphin on the line and caught them both. Put the baits out again and only a few minutes went by before we caught 2 more. We also had a downrigger down with a live speedo mackerel as bait. The wahoo hit the downrigger bait like a freight train. He smoked the drag off the reel with 2 long runs. After that he was spent and we fought him up in 15 minutes. We ended the trip with 8 mahi-mahi and a nice wahoo. We also missed a sailfish. Dang it, the sailfish would have been awesome. 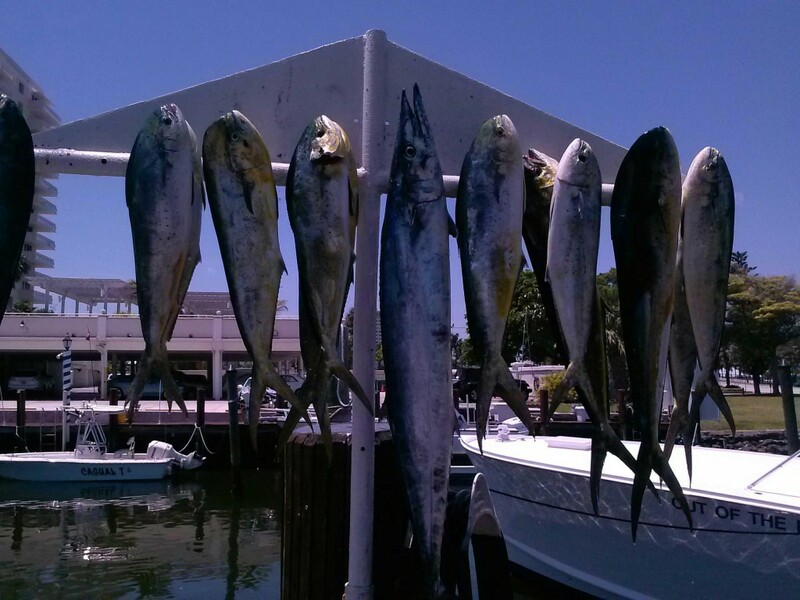 Dolphin are biting good in Ft Lauderdale on our fishing charters for several days now. May and June are great months for dolphin fishing, so get out there if you can do some fishing. 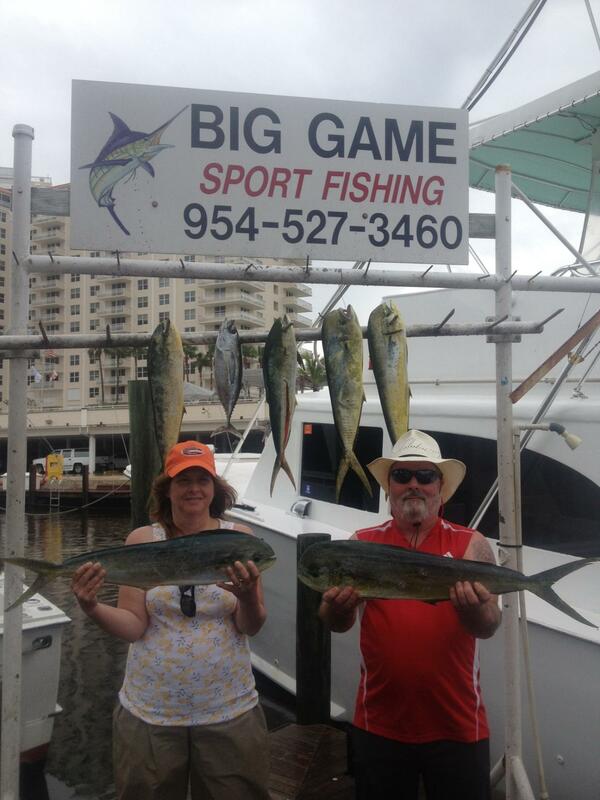 Below is a picture of yesterday’s catch, another good dolphin fishing charter in Ft Lauderdale. The weather got crappy today… rainy, windy and rough. Our charters still braved the rain and seas and came in with a great catch. We were 3 for 4 on sailfish and we caught several blackfin tunas and bonitos. Sailfishing gets really good with a falling barometer. All the fish were caught by dragging live ballyhoo and speedos out of the outriggers between 100 and 300 feet of water, just south of the inlet in Fort Lauderdale. 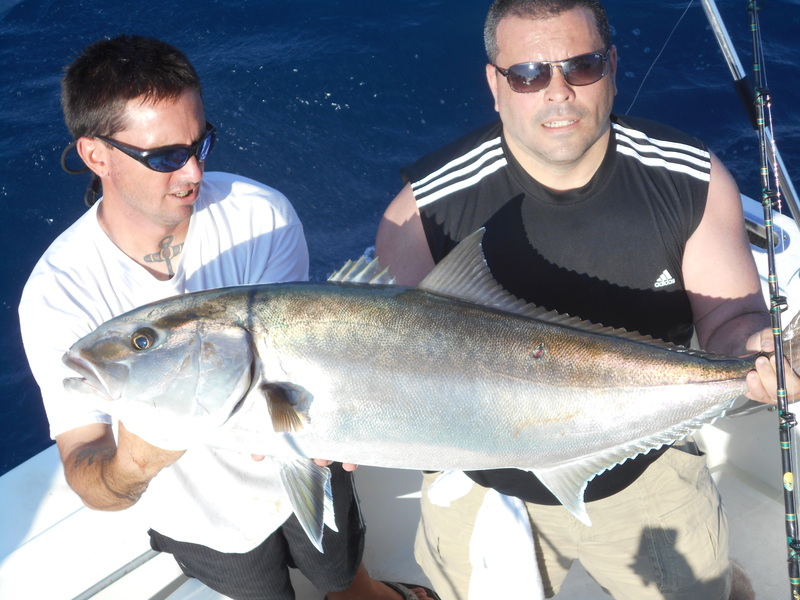 Sharks and amberjacks are also biting good in Fort Lauderdale. Several very large hammerhead sharks were caught this week as well as a monster mako shark and several big duskys. This is the tail end of shark fishing season in Fort Lauderdale, but they are still biting strong. Even after the migrating sharks move past our waters, we’ll still have pretty decent shark fishing throughout the summer months. Good luck fishing everyone. 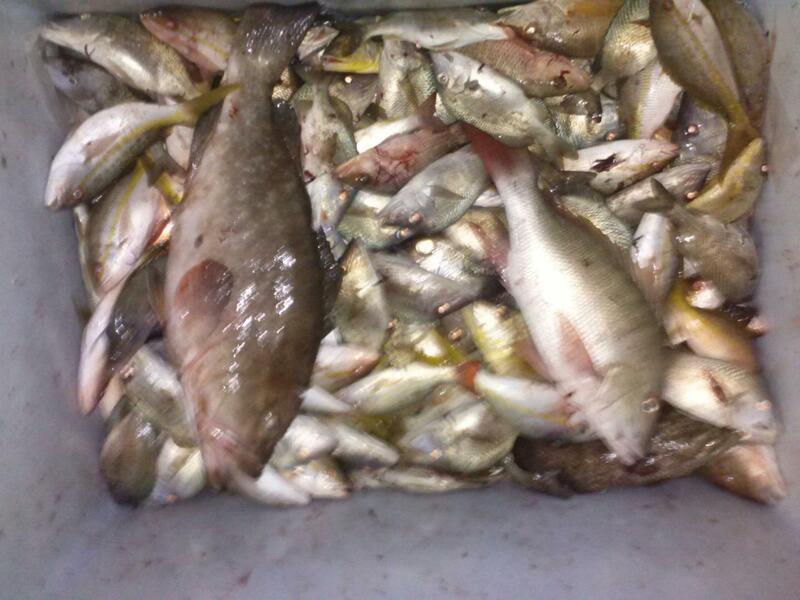 Box full of snappers and groupers from last night's anchor fishing trip aboard the Catch My Drift. Excellent action the past few nights on the night anchor fishing trips. 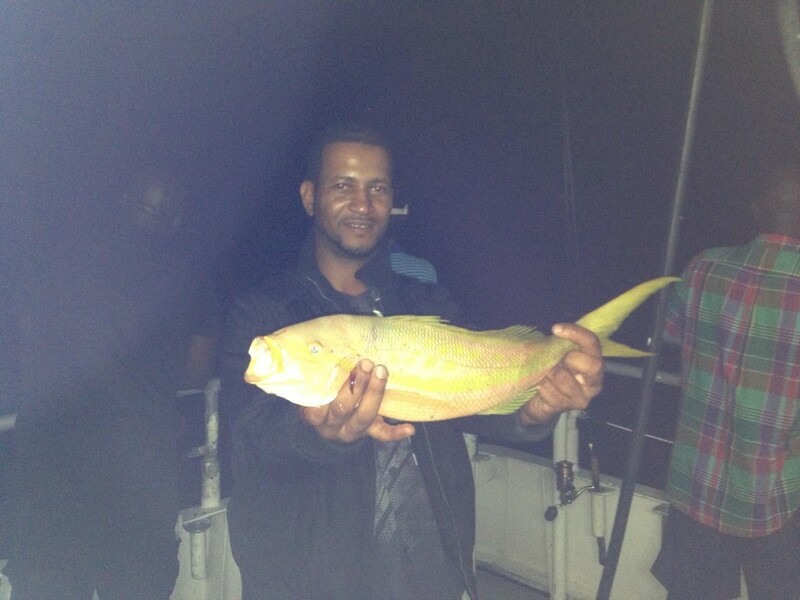 Yellowtails and mangrove snappers are biting exceptionally well, with some nice mutton snappers and groupers mixed in. Last night, on the Saturday Night 6 hour anchor trip, we caught a boatload of snappers. The action didn’t get started till about 11 o’clock, but when the bite turned on, the fish started hitting the deck. 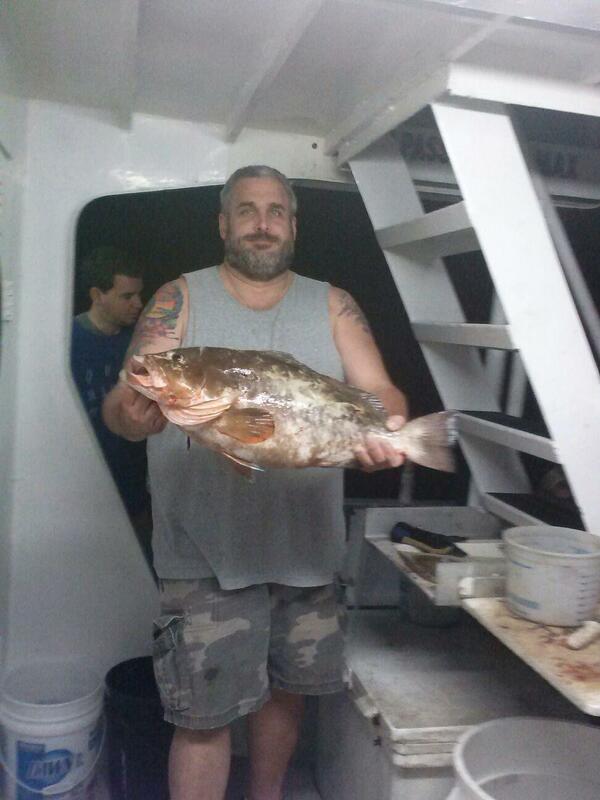 June is generally the peak month of the year for night anchor fishing in Fort Lauderdale. Groupers have been hit or miss lately, but they are down there. Red groupers and black groupers are biting the best, but there are also the occasional gag or scamp grouper too. The hind groupers, which are the strawberry groupers, rock hinds and coneys, also bite pretty regularly on the night anchor trip. And of coarse grunts, which are very abundant on the bottom, also bite throughout the night and add to the action on the trip. We caught 2 full 5-gallon buckets of grunts last night. Grunts are in the sweet lip family of fish and are very good eating as well, they’re just small and hard to filet. Night fishing trip has been the best drift boat trip for action lately. We’re getting some kingfish, bonitos and blackfin tunas during the day trips, but if you want to get the best action, come out fishing at night. Good luck fishing everyone. 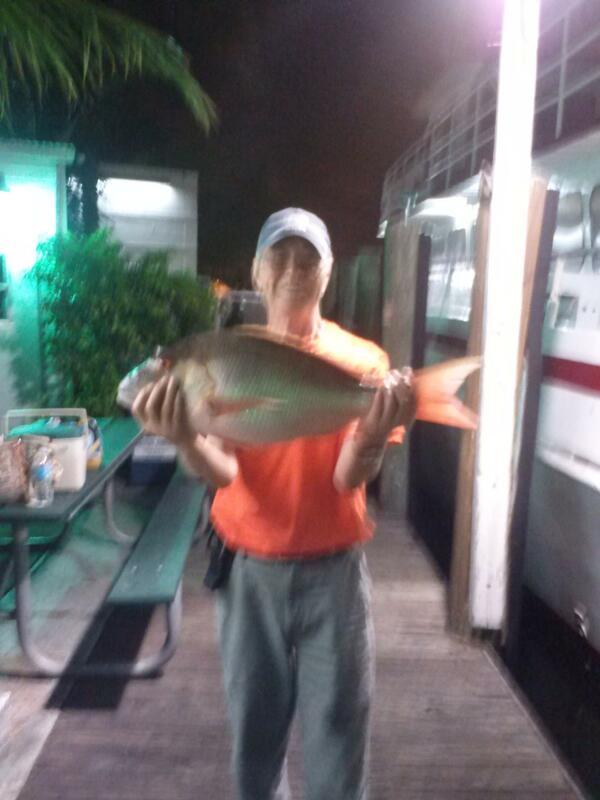 Nice mutton snapper caught with a ballyhoo plug on the bottom.